Paramount has announced that they're releasing Lindsay Anderson's if... on DVD on June the 11th. It will be a single-disc set, and all other details are TBA, except that it will come "with a realm of extras" (perhaps enough to rival the American two-disc release from Criterion, which is also due in June). The High and the Mighty - Two-disc special edition featuring introduction by Leonard Maltin; commentary by Leonard Maltin, William A Wellman, Pedro Gonzales-Gonzales and Vincent Longo; The Batjac Story; Stories from the Set; On Director William A Wellman; The Music and World of Dimitri Tiomkin; Restoring a Classic; A Place in Film History; Ernest K. Gann- Adventure; Author and Artist; Flying in the Fifties; theatrical trailer; TV trailer; Batjac Montage; The High and Mighty Premier Footage and a photo gallery. Hondo - Special edition featuring commentary by Leonard Maltin, Western Historian Frank Thompson, and Actor Lee Aaker; A Special Introduction by Leonard Maltin; The Making of Hondo; Profile: James Edward Grant; The John Wayne Stock Company: Ward Bond; From the Batjac Vaults; The Apache; photo gallery; original theatrical trailer and a Batjac Teaser. McLintock! - Special edition featuring commentaries by Leonard Maltin, Frank Thomson, Maureen O’Hara, Stefanie Powers, Michael Wayne, Andrew McLaglen; Special Introduction by Leonard Maltin; The Batjac Story: The Legacy Michael Wayne; Maureen O’Hara and Stefanie Powers Remember McLintock! ; A Good Ol’ Fashioned Fight; The Corset: Don’t Leave Home Without One! ; Two-Minute Fight School; photo gallery; original theatrical trailer and a Batjac teaser. Island in the Sky - Special edition featuring Introduction by Leonard Matlin; Commentary by Leonard Matlin, William Wellman, Jr., Darryl Hickman, James Lydon and Vincent Longo; Dooley's Down: The Making of Island In The Sky; Ernest K. Gann - Adventurer, Author & Artist; Flight School - The Art of Aerial Photography; The John Wayne Stock Company: Harry Carey, Jr.; Flying For Uncle Sam; theatrical trailer; newsreel footage of Premiere; Introduction to Gunsmoke TV Promo; Batjac Montage and a photo gallery. 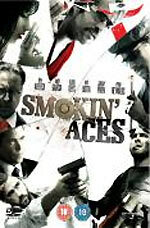 Universal will release Joe Carnahan's crime thriller Smokin' Aces on DVD and HD-DVD on May the 7th. The film will be presented in "16 x 9" format, with "stereo with 5.1 audio available", and English ENNHOH subtitles. No bonus features were mentioned in the press release, but some etailers - Play.com, for example - are listing a commentary with writer/director Joe Carnahan & editor Robert Frazen; Shoot 'Em Up: Stunts and Effects; The Big Gun; The Line-Up; Cowboy Ending; outtakes; deleted and extended scenes and the Hot Fuzz International trailer. The RRP for the DVD is £19.99. RRP for the HD-DVD version is £24.99. Finally, I am indebted to James Lee for pointing out that Optimum's forthcoming Masque of the Red Death DVD (more details below) features the same cut version as the US DVD. According to the IMDb, this version is "missing a shot where Francesca is slapped across the face and also edits a later scene where she is stripped and thrown into a bathtub". According to James, these shots were in the pan-and-scan version used for the UK VHS and original UK DVD releases, and in Image's NTSC laserdisc version. Twentieth Century Fox Home Entertainment will release The Addams Family - Volume One on DVD on April the 9th. The three-disc set will feature twenty-two episodes, in their original 4:3 format, with mono 2.0 audio, and optional English subtitles. A 30,000 square-foot exhibition of original props, models, artwork, vehicles and costumes from the Star Wars movies will open at the County Hall, Westminster, London on May the 5th. The exhibition has been seen by more than a million visitors during its tour, which has taken in Japan, France and Portugal. 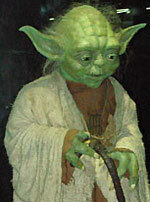 Star Wars: The Exhibition features nearly three hundred items, including a life-size Naboo N-1 Starfighter prop, R2D2 and C3P0, the original model of Yoda, an original Darth Vader costume and mask, Darth Maul's costume, Queen Amidala's wardrobe and Anakin Skywalker's pod racer. Tickets are £16.50 adults, £12.50 child, Under 5 free. Ticket Sales and more information: www.starwarstheexhibition.com Star Wars: The Exhibition will be open seven days a week, from 10am and 8pm, until September the 1st. 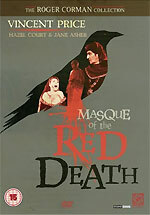 I've had a look at the Optimum's The Masque of the Red Death disc: the first release in their Roger Corman Collection. The new disc boasts a 2.34:1 anamorphic transfer, which is something of a relief, after the hideous pan-and-scanned 2003 version, in the Zoltan Hound of Dracula / The Masque of the Red Death / Night of the Eagle box set, from Warner Home Video (both transfers were sourced from Studio Canal). The new print carries a modern MGM logo (even more recent than the one on their Region 1 disc), and looks very nice indeed. There's still some grain - no more than you'd expect - and the usual anamorphic lens distortion, but otherwise the print is very clean, and cinematographer Nic Roeg's often-delicate colours look very natural. In short, it's a very nice-looking disc. Sadly, there's no sign of the Corman interview or the theatrical trailer which are on MGM's Region 1 disc. Optimum's disc has an RRP of £9.99, so I suppose it would be churlish to complain too much. That's the good news. The bad news is that Optimum have cancelled the release of another film in the Corman Collection, A Bucket of Blood. Menu screens and a few sample screen-grabs for the new Masque disc can be found here. (The menus from the 2003 disc can be found here). Metrodome will release Andrew van den Houten's horror thriller Headspace on DVD on April the 16th. The film, which is described as "combining the gruesome imagination of H.P. Lovecraft with the fierce and disturbing intelligence of David Cronenberg", stars Olivia Hussey, Ghostbusters' William Atherton, Blade Runner's Sean Young, Mark Margolis, The Howling's Dee Wallace Stone and genre icon Udo Kier. The disc will feature a director's commentary track; a Making of... featurette called Fractured Skulls (27m); and a trailer (substantially less than the Region 1 version, which has two commentary tracks, amongst other additional bonus features). Audio is offered in Dolby Digital 2.0 and 5.1 formats (at 192 and 448kbps, respectively). The film is presented in 1.78:1 anamorphic format. The RRP is £15.99. A clip from Freemantle's forthcoming The Wind in the Willows - The Complete First Series DVD set can be found here. Optimum have clarified some details of their forthcoming Napoleon DVD, which I will reproduce verbatim, since there seems to be little to be gained from paraphrasing it: "the version that we are releasing is the silent version restored by Francis Ford Coppola in 1980 with a new score composed by his father Carmine. The running time is 223 mins and the DVD has been encoded with a 16:9 aspect ratio. For those of you that know the film, you will be aware that Abel Gance shot it envisaging a three screen Polyvision projection technique to create a huge panorama for some scenes. This proved impractical and so this was only actually used by Gance for the final 20 minutes or so of the film. In our release, the 16:9 encoding allows for the three screens to be viewed as one widescreen for these last 20 minutes as Gance originally intended, with the preceding footage appearing as 4:3 on a 16:9 widescreen"
Twentieth Century Fox Home Entertainment will release the second (and final) season of the Emmy Award-nominated black comedy Dead Like Me on DVD on April the 2nd. The set will feature fifteen episodes, spread across four discs. They will be presented in 4:3 format, with Dolby Digital 5.1 audio. The set will also contain "a number" of deleted scenes; a Dead Again... Again featurette; Putting Life Into Death special effects featurette; and a photo' gallery. The RRP is £39.99. 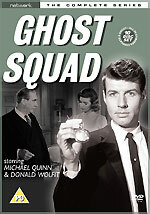 Network will release all thirty-nine hour-long episodes of the 1962-63 ITC espionage series Ghost Squad on DVD on April the 23rd. The series, which chronicled the work of a top secret government spy organisation which trained operators to work independently, and deep undercover, ran for two series (of thirteen and twenty-six episodes, respectively), before spinning off into sequel series GS5. The series starred Michael Quinn, Donald Wolfit and Angela Browne. Guest cast members include a host of ITC regulars, including Alfred Burke, Honor Blackman, Warren Mitchell, Joseph Furst, John Carson, Anton Diffring, Hazel Court, Leonard Sachs, Roger Delgado, Edwin Richfield, Geoffrey Bayldon, Douglas Wilmer, and dozens of others. The series also provided Doctor Who star William Hartnell with his only ITC role, in the episode High Wire. There was plenty of Doctor Who talent behind-the-scenes, too, with episodes written by Robert Holmes, John Lucarotti, Louis Marks and Malcolm Hulke. Other contributors include Minder's Leon Griffiths, The Avengers creator Brian Clemens, and his fellow Avengers regulars Roger Marshall and Philip Levene. The series, which has not been seen since its first broadcast, will be presented on ten discs, along with the insert film footage from GS5 - all that survives, apparently - and an image gallery. 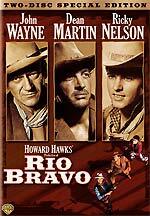 Warner Home Video will release a digitally restored and re-mastered two-disc version of the Howard Hawks classic Rio Bravo on DVD on May the 28th. The film will be presented in anamorphic 1.85:1 format, with 1.0 audio. The set will feature an audio commentary (by Hawks aficionado John Carpenter and Richard Schickel), a vintage documentary about Hawks (1973's The Men Who Made The Movies - Howard Hawks), two new featurettes (Commemoration - Howard Hawks' Rio Bravo and Old Tucson - Where the Legends Walked), and a trailer gallery. RRP is £15.99. 2 Entertain has confirmed that the Two Ronnies DVD being released on April the 30th is indeed of the complete first season, which originally aired in 1971 (it's the series with Hampton Wick as the running story). 2 Entertain are quoting a running time of "354m approx" for the eight-episode series. The RRP is £15.99. Last week I attended a press screening at the IMAX for Zach Snyder's Battle of Themopylae epic 300 (a faithful adaptation of Frank Miller's stark graphic novel). If you've seen anything of the film, you'll probably have a very good idea of what it's like: loud, brash, dynamic and spectacular! If you plan on seeing the film, and can get to the IMAX, then I thoroughly recommend seeing it on their giant screen. I've seen quite a few feature films at the IMAX, and 300 has the best audio mix I've heard there so far. The film opens at the London IMAX on March the 22nd.